Can you imagine sending your children to school to be taught by a teacher who can’t sign her name? Would you be confident filling a prescription from a doctor who didn’t know how to sign it? If you made a legal agreement with a business enterprise, would you trust an unsigned contract ? These questions may seem preposterous to you, but these and many other examples of people in every walk of life unable to sign their own names is about to become a reality. So-called “experts” have decided that after thousands of years, cursive writing is unnecessary for young students learning to type on digital keyboards. “They can always print,” has become the dubious mantra of these experts. Similar theories have resulted in children who cannot really read, because they have been taught to guess when they see a word that seems hard to pronounce. Correct spelling is rapidly being replaced by texted abbreviations used by those who insist that everyone can spell differently. Now we are about to see boys and girls who haven’t been taught to read or spell correctly emerge from school unable to even sign their own names. This isn’t by accident, but by design. But there has been a reaction by parents and educators who don’t approve of abandoning cursive writing. The following article, by Julie Carr Smyth of the Associated Press, focuses on their efforts. 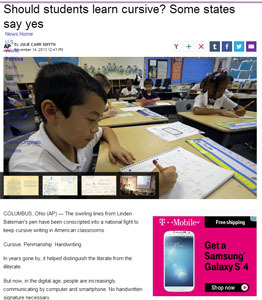 COLUMBUS, Ohio (AP) – The swirling lines from Linden Bateman’s pen have been conscripted into a national fight to keep cursive writing in American classrooms. State leaders who developed the Common Core – a set of preferred K-12 course offerings for public schools – omitted cursive for a host of reasons, including an increasing need for children in a digital-heavy age to master computer keyboarding and evidence that even most adults use some hybrid of classic cursive and print in everyday life. “If you just stop and think for a second about what are the sorts of skills that people are likely to be using in the future, it’s much more likely that keyboarding will help students succeed in careers and in school than it is that cursive will,” said Morgan Polikoff, an assistant professor of K-12 policy and leadership at the University of Southern California. States that adopted Common Core aren’t precluded from deviating from the standards. But in the world of education, where classroom time is limited and performance stakes are high, optional offerings tend to get sidelined in favor of what’s required. That’s why at least seven states – California, Idaho, Indiana, Kansas, Massachusetts, North Carolina and Utah – have moved to keep the cursive requirement. Legislation passed in North Carolina and elsewhere couples cursive with memorization of multiplication tables as twin “back to basics” mandates. They further argue that scholars of the future will lose the ability to interpret valuable cultural resources – historical documents, ancestors’ letters and journals, handwritten scholarship – if they can’t read cursive. If they can’t write it, how will they communicate from unwired settings like summer camp or the battlefield? “The Constitution of the United States is written in cursive. Think about that,” Bateman said. It is almost embarrassing to explain why cursive writing should not be abandoned. But the debate has started and cultural conservationists must be engaged. Cursive writing increases mental agility and creativity. It requires the writer to concentrate more on spelling and reading skills. Students who are not taught cursive writing will be unable to read words written by others who can write. They will stare at everything from the original draft of the Declaration of Independence to letters written by members of their own family with blank expressions on their faces. Cursive writing was once taught in the first grade. If something isn’t done, tomorrow’s first grade teachers will be unable to write. Do you want to be certain that your children are not only learning to write, but to read and spell correctly? You’ll find guidelines to help you evaluate what your children are learning here.